Brewer Science is deeply committed to making our communities a better place to live and work. We are continually involved in supporting multiple youth, charitable, social service, academic, arts, and athletic organizations. Brewer Science is dedicated to giving not only monetary gifts but also gifts of our time and resources. Since 2002, Brewer Science, the Springfield Regional Arts Council, and Arts Rolla have hosted an exhibit in Springfield, Missouri, featuring original art and photography from all over the Midwest. The exhibit begins on the First Friday Art Walk in October at The Creamery Arts Center. 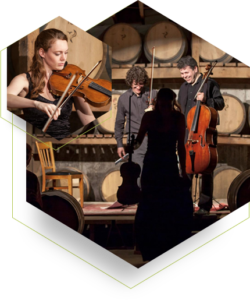 Each year, Brewer Science invites the Jacques Thibaud Trio to Rolla for an evening of exceptional music. This trio—made up of Hannah Strijbos on viola, Burkhard Maiss on violin, and Bogdan Jianu on cello—is a world-renowned group from Berlin, Germany. To learn more about the Jacques Thibaud Trio, visit jttrio.com. Supporting science, technology, engineering, and math (STEM) programs and raising STEM awareness are of the utmost importance to us at Brewer Science. Not only do we open our doors to students and graduates each year with our intern/co-op program, but we also go out into the community to raise awareness and money for local schools. This community outreach program, called Giving Back Through STEM Education, includes hosting a Science Day Academy at local elementary schools and hosting the local Science & Art Festival in July of each year, which includes the Mad Scientist 5k Run/Walk and hands-on science experiments led by Brewer Science interns. Proceeds from the Science & Art Festival benefit science classrooms at Belle and Vienna, Missouri, schools, with Brewer Science matching a portion of the funds raised. Since 2004, Brewer Science has held an annual Chili/Soup Cook-Off to raise money for the Dr. Norman Dobson Memorial Scholarship. Our employees supply various chili and soup dishes for the luncheon, and Brewer Science matches a portion of each monetary donation made. The late Dr. Dobson served as Managing Director of Research & Development at Brewer Science until he lost his struggle with ALS in March 2005. Each year, a student at Missouri State University in Springfield, Missouri, receives the Dr. Norman Dobson Memorial Scholarship to continue his or her studies at the Center for Applied Science and Engineering (CASE). In 2014, Brewer Science and the Rolla Robotics Team created the Phil Allen Memorial Robotics Scholarship. The scholarship is sponsored in part, by Brewer Science and the members of the community in memory of Brewer Science employee, Phil Allen who lost his life in a car accident in October of 2014. Each year the scholarship is presented to a graduating college bound Rolla High School senior, who is an active member of the Rolla Robotic team, with a cumulative GPA of 3.0.